I'm playing through Mass Effect a second time right now as a douche bag, and I must admit the game is a lot more fun this way. So I'm once again having Mass Effect fever, and am eagerly anticipating Mass Effect 2. 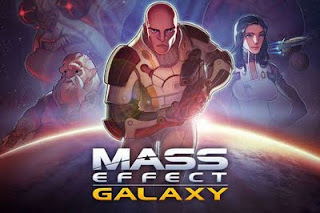 Part of that anticipation led me to look up Mass Effect Galaxy, an iPhone side story set in the Mass Effect universe. Now, I avoided this game for a long while because of the negative press it has received from many game sites. Most seem to agree that the story elements are fantastic, but the game elements are horrible. I'm here to tell you they are all wrong. It is actually a fantastic game all around. Now I won't say it is the greatest iPhone game in the world, as it does have its issues, but currently it is my go to game when I have a few minutes to spare, and that says a lot (sorry Peggle you've been dethroned). The problem I see most people having with it, goes back to the age old argument (or as age old as motion controls are), of how to review a motion controlled game. This whole ordeal I think is a plague spread across gaming press as no "professional" game reviewer seems to understand the concept behind it. They are stuck in a train of thought that game controls must be perfectly accurate, and if they aren't the game is a failure. While I agree even motion control games need to have some level of control, the fun factor you are having playing the game should always outweigh how tight the controls are. Are you having fun? Yes? Then the game is a success. This isn't even an issue with Mass Effect Galaxy because the designers made a game based on imprecise motion controls. It uses the weakness of the control method as its strength. Let me try and explain. When a casual observer looks at a Mass Effect Galaxy screen they might think of something like Diablo or Warcraft. When the game doesn't control like that, they might think the game fails. But Mass Effect Galaxy isn't supposed to be played like a loot collecting game, or top down RPG, it has more in common with a Marble Madness, or maze game. The difference here is that your marble has a gun and can use super powers. You guide your character, Jacob, through different sections of space ships and space stations killing the intruders, or pirates, or whatever. But the ship sections are mazes you tilt the iPhone around and have Jacob navigate as you would a marble through a maze. He automatically fires at the enemy you target. On the right side of the screen are options you can use to further increase your attack power. You can use biotics to slam a virtually barrier into him, take down their shields, or shoot a missile at them point blank range. The game is a puzzle/shooter more then anything. 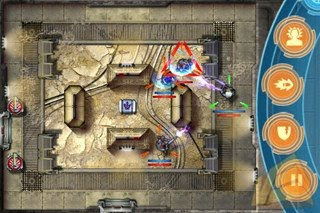 The only problem with the game part that I have is that it auto targets the enemies for you. Say there is three enemies in a room. It targets the bad guy closest to you. After he is dead, for some strange reason the game almost always targets the guy furthest away from you. Of course, you can tap on the guy closest to you, but when you need valuable seconds, this can sometimes become disorienting. Also the game is a memory hog, and can chug along sometimes if you haven't rebooted your iPhone in a while. The other half of the game is the story, which has you preventing an terrorist attack on the Citadel, when a controversial ambassador is set to arrive there. The story is excellent, and all the characters are beautifully drawn and fully realized. The two main leads, Jacob and Miranda, are also key players in Mass Effect 2, which releases in January 2010. Bioware promises some kind of extra content for those who successfully finish Mas Effect Galaxy. 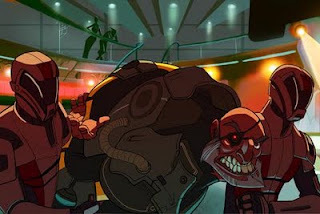 If anything the game helps add some great character depth to some characters before you meet them in the main game, which will naturally make me more inclined to pick them on missions. 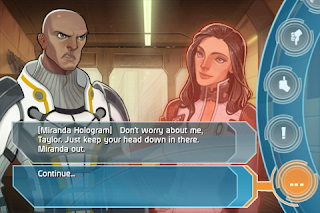 The conversation system is more, old school adventure game style, where you pick directly what you will say to other characters. However, you can judge the impact of what you say beforehand by Jacob's facial animations or by an icon by your choice. It works really well, and as with the main games, you can make Jacob as nice or as jerky as you want. For Mass Effect fans I highly recommend the game. And even for someone who never played Mass Effect, it's a great introduction into the series, with a nice scaled back storyline, that isn't as complicated as the main game, and is a great introduction to how the games handle character development.